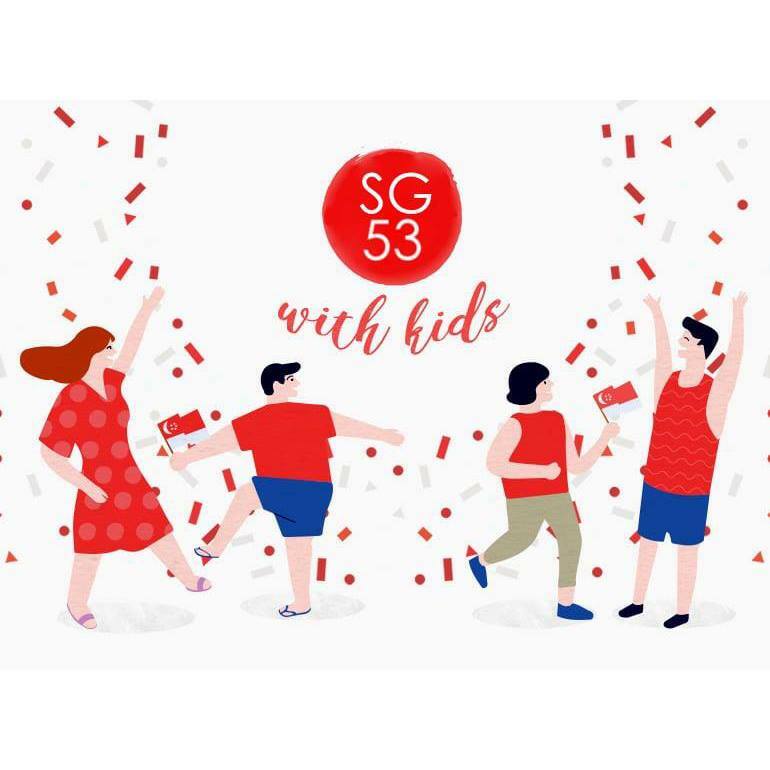 As 53rd National Day comes along, we’re here to give you 53 things to look forward to aside from the National Day Parade! Here are 53 deals, discounts, sales, and offers that you can enjoy this national holiday. Take the whole family to Fish & Co. this National Day to avail of the kids’ FREE ice cream when they complete 1 activity from the kids’ activity sheet. J65, the all-day dining restaurant, features the freshest seafood on ice and a range of multicultural cuisine of Singapore with signature home-style dishes. With buffet themes specially curated by the team of talented chefs in an open kitchen, take a look-in at mouth- watering dishes being fixed to perfection. Here, there’s something for every occasion and celebration. 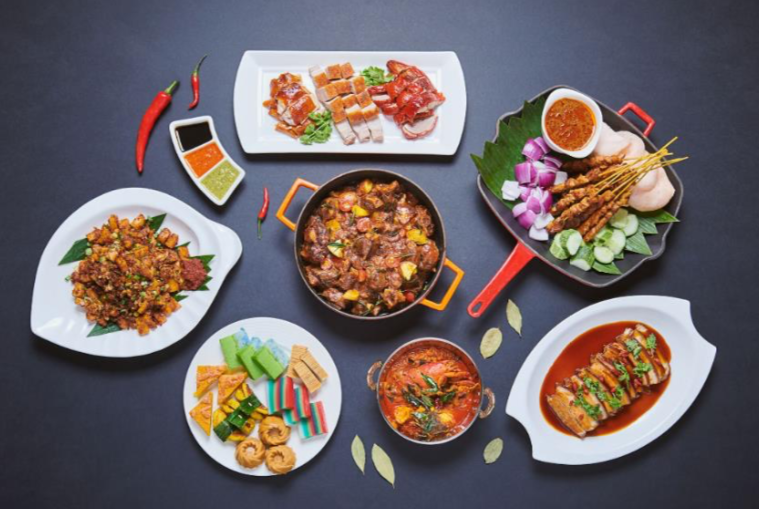 Feast on local favourites at the Singapore-themed buffet with a rotating menu inclusive of, but not limited to, Fried Carrot Cake, Singapore Chicken Rice, J65 Signature Laksa, Braised Stew of the Day, DIY Kueh Pie Tee, Local Nyonya Kueh, Local Flavours Ice Cream and more. Ah Hoi’s Kitchen is all about al-fresco dining with authentic Singaporean flair. This local dining institution has made quite a name for itself as a must-visit restaurant over the last few decades. 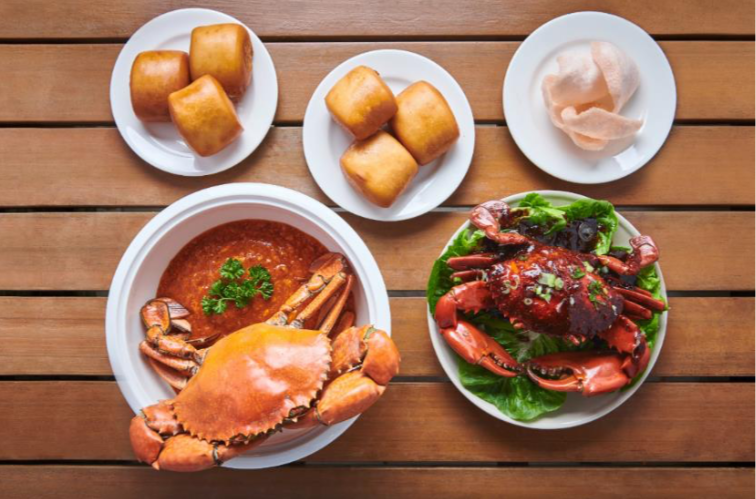 Featuring signatures and all-time-favourites, Chili Crab, Black Pepper Crab and Salted Egg Crab with Crispy Yam, Chef Tiger embraces and enriches the true flavours of Singapore through his 30 years of culinary experience. Ranked high on favourites, revel in seafood paradise as you indulge in a fiery Singapore Chilli Crab and/or an aromatic Black Pepper Crab without busting the bank! Jen’s Kitchen On-the-Go, connects the community with its artisanal coffee selection. Discovering beans one entrepreneur at a time, our passion for local coffee is rivalled only by our love of sharing it. Acknowledging that connectivity is key – the fast free WiFi, charging stations, computers and printers available are befitting for your business and social needs. Shake up the midday blues with one of the five local-inspired milkshakes exclusively created for the nation’s big day. 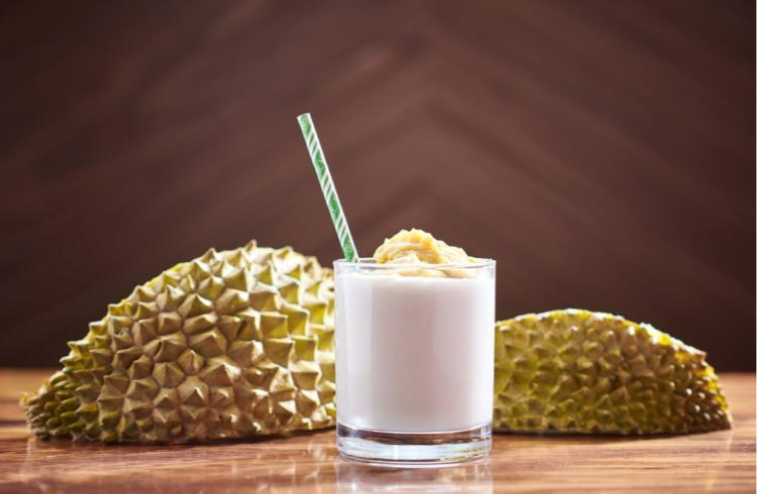 Kopi, Teh, Coconut, Bandung or Durian milkshake – dive into these delightful pick-me-ups. 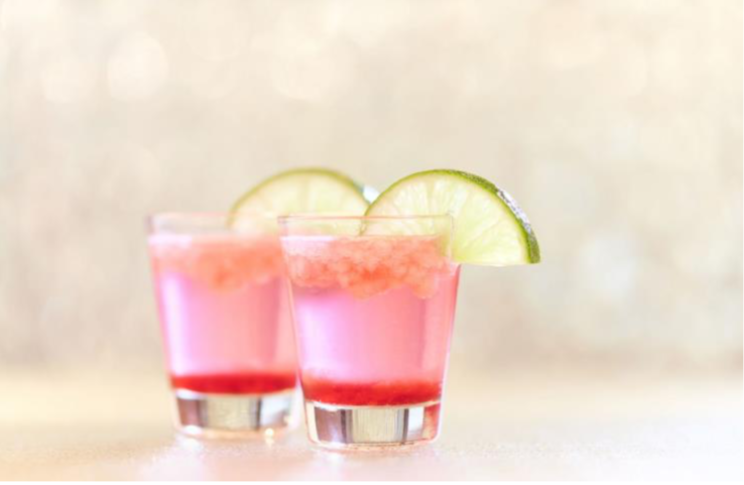 Throwing in a little twist to the regular G&T, chug-a-lug this August with 1-for-1 cocktail shots at Rumpoles as you celebrate Singapore’s Independence with the nation. 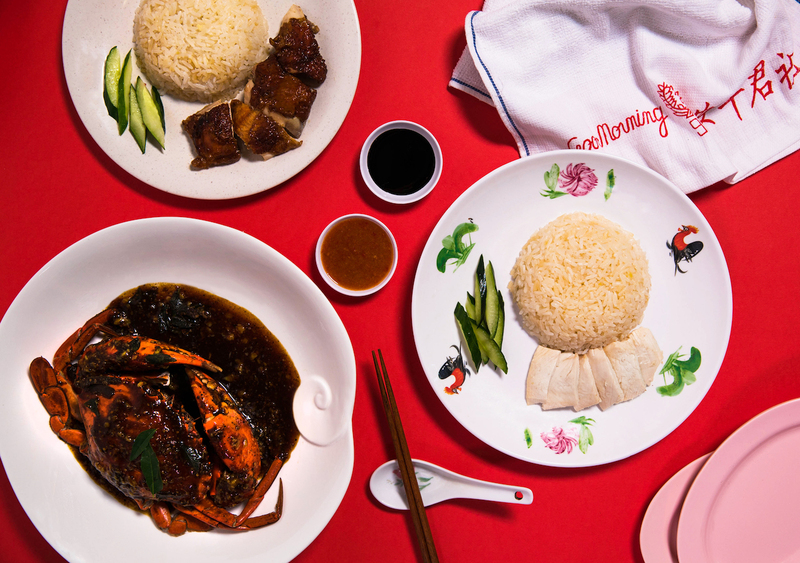 Here’s what Deliveroo has to offer Singaporeans on our 53rd National Day! 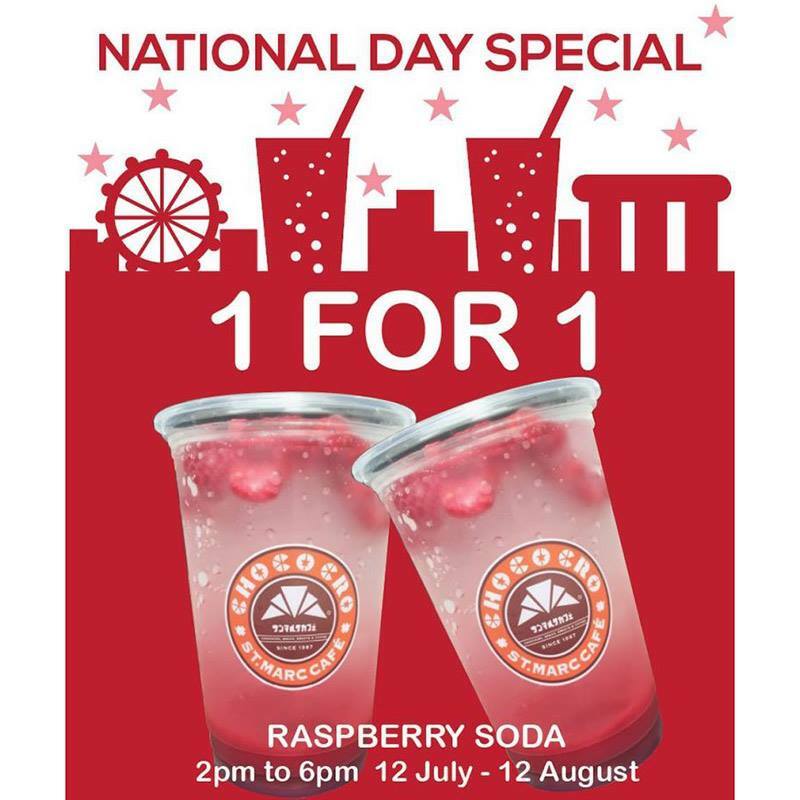 Try their 1 for 1 Raspberry Soda until August 12! 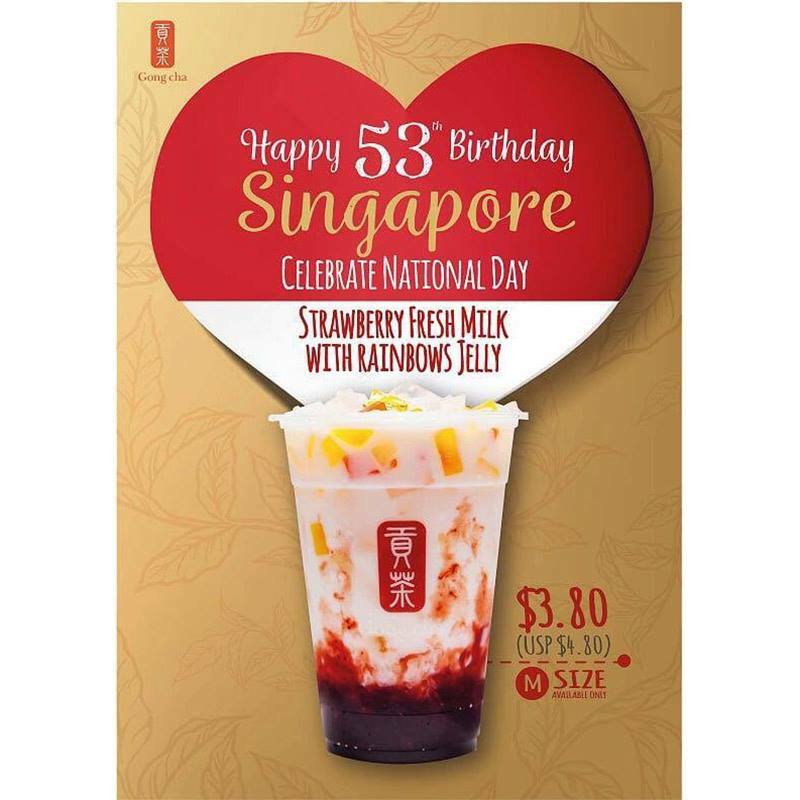 Get a Medium Strawberry Fresh Milk with Rainbows Jelly for only $3.80. Pay just $2.50 for a Medium Chocolate Milk with Speculoos Biscuit crumbs. 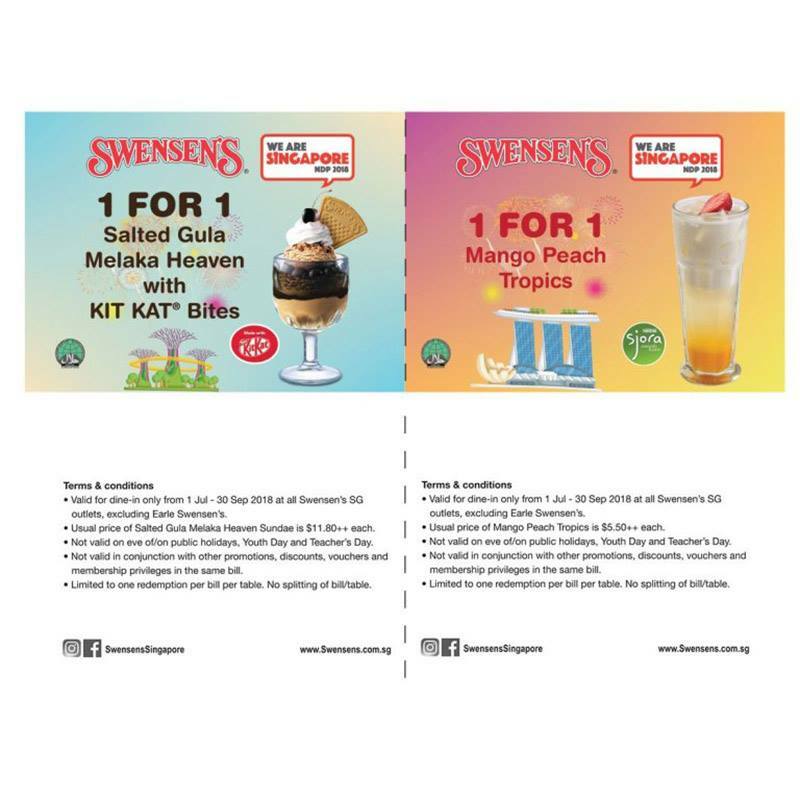 Avail of the 1 for 1 Salted Gula Melaka Heaven and Mango Peach Tropics from Swensen’s today. Pay only $5 for 2 Donuts + Iced Chocolate/Cold Brew in several branches! 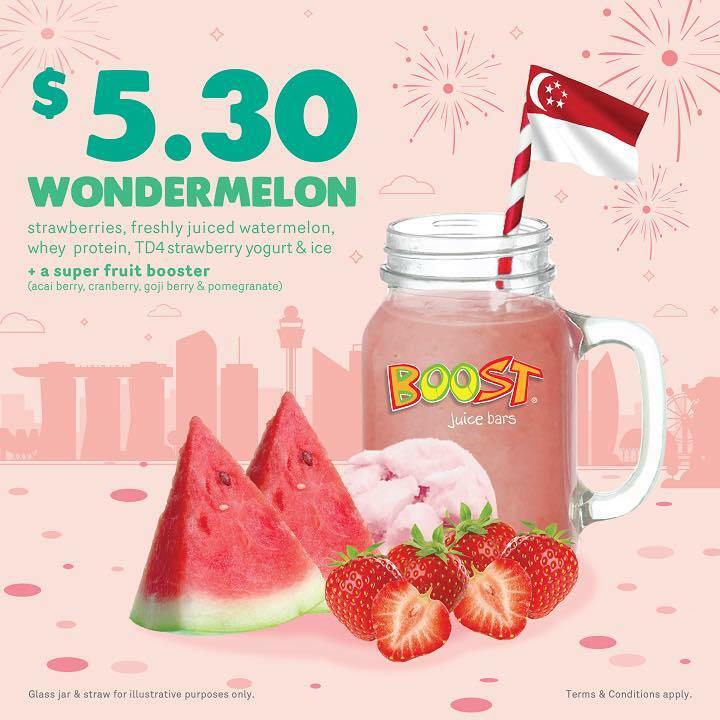 $5.30 Wondermelon promo from Boost Juice! Here’s a special treat from Cold Stone Creamery for Nasi Lemak Ice Cream! Available only on 9 August 2018, be the first 53 Mastercard Cardholders at every outlet in Singapore to enjoy $2 Nasi Lemak Ice Cream on Love It size. While stocks last! You get $5.30 off your next ten bookings at Chope if you use their promo code when booking offers. Go to their website to avail of further discounts and deals. 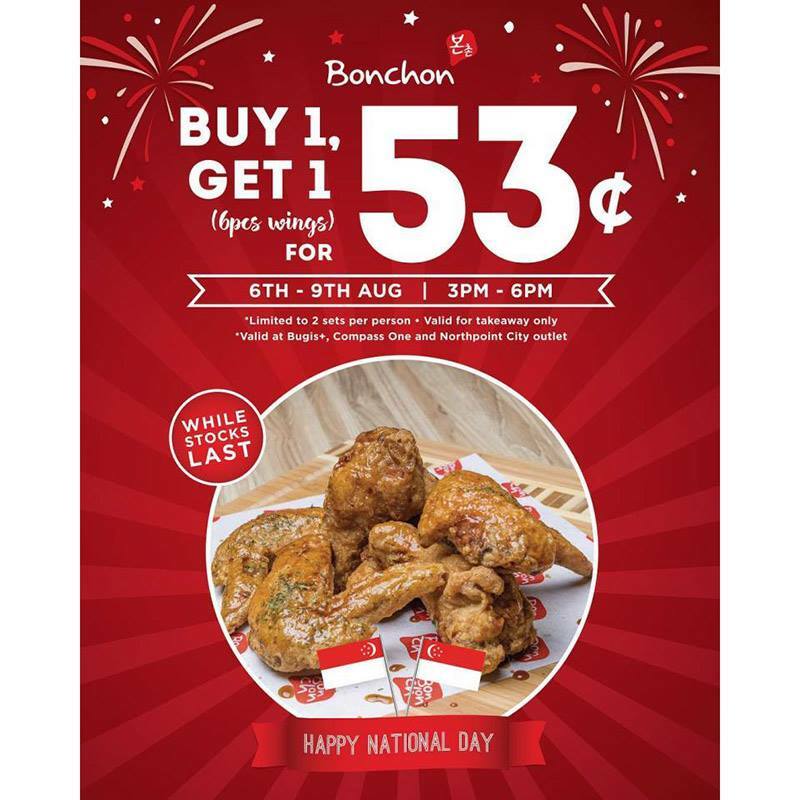 Buy 1 set of 6pcs wings, Get 1 set for only $0.53! 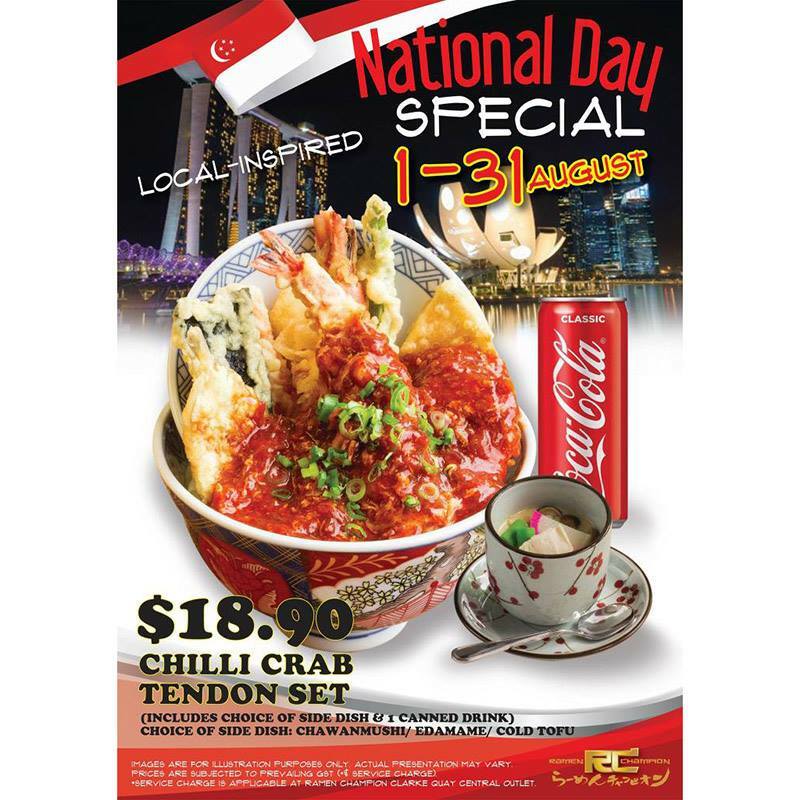 Grab a National Day Special $18.90 Chilli Crab Tendon Set today! 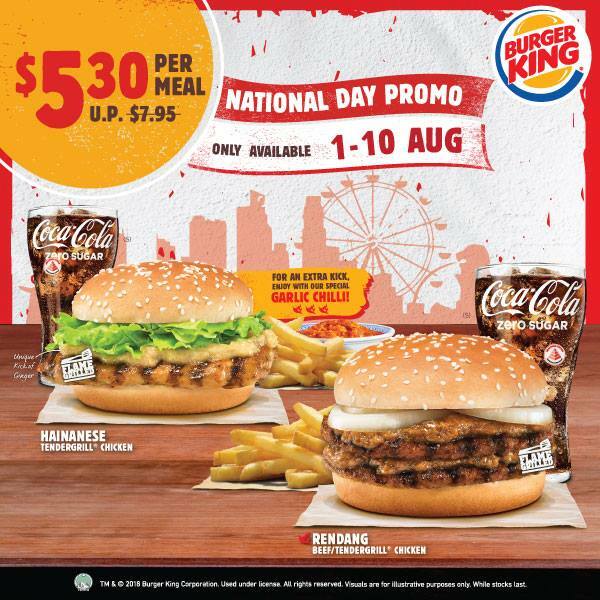 Check out this $5.30 National Day Promo Value Meal (Hainanese Tendergrill Chicken/Rendang Beef or Tendergrill Chicken). 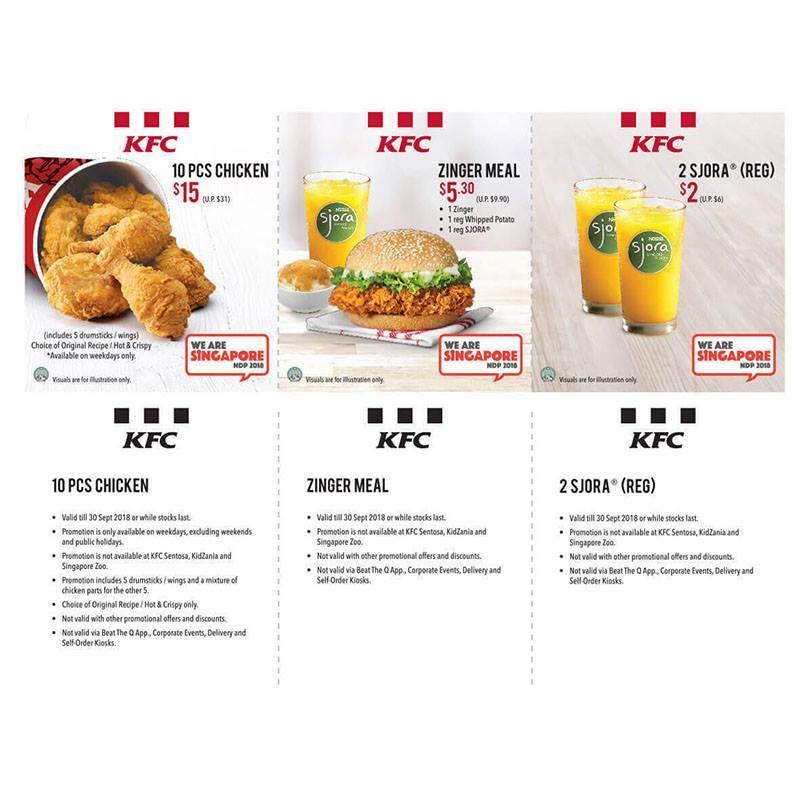 KFC has a $5.30 Zinger Meal, $15 for 10 pcs chicken. 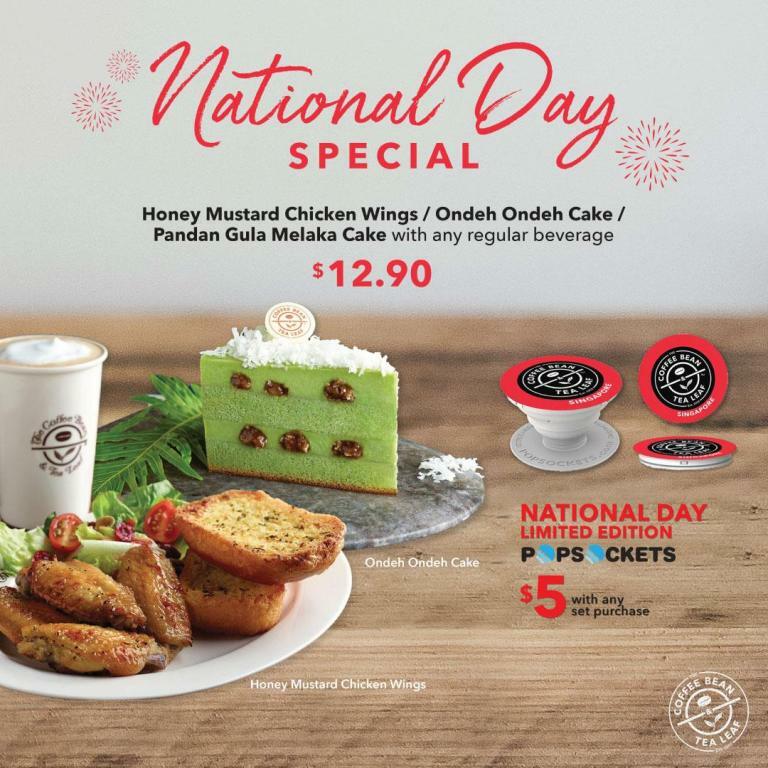 The Coffee Bean & Tea Leaf National Day Special $12.90 Honey Mustard Chicken Wings / Cake with any regular beverage. Can’t get enough of Yoshinoya’s flavourful Beef Bowl? 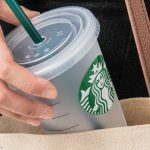 You can get one for $5.30 this National Day! 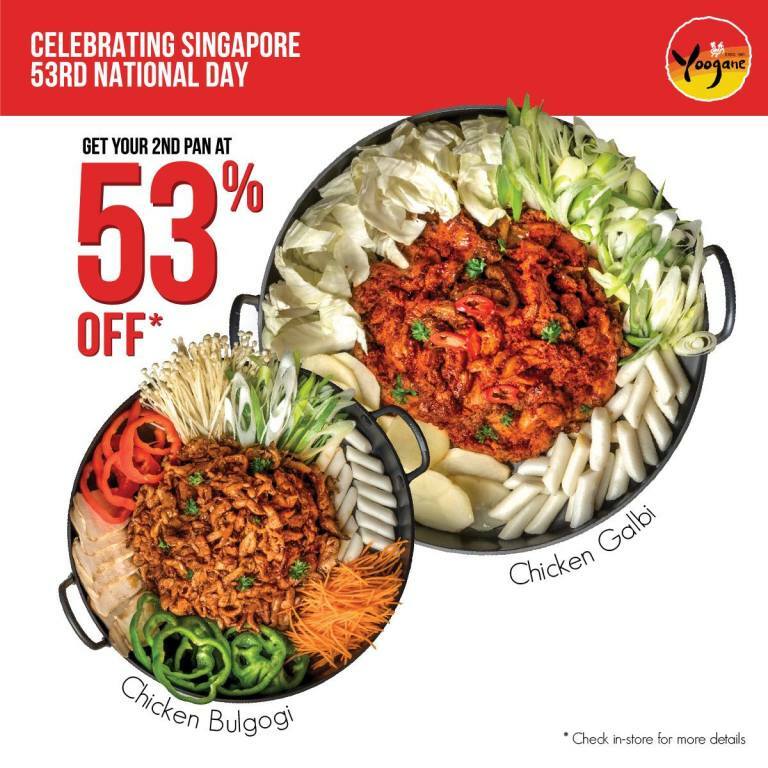 You get your 2nd pan of Chicken Galbi or Bulgogi at 53% off on National Day! You get 20% off site wide at Zalora if you use their special promo code today. 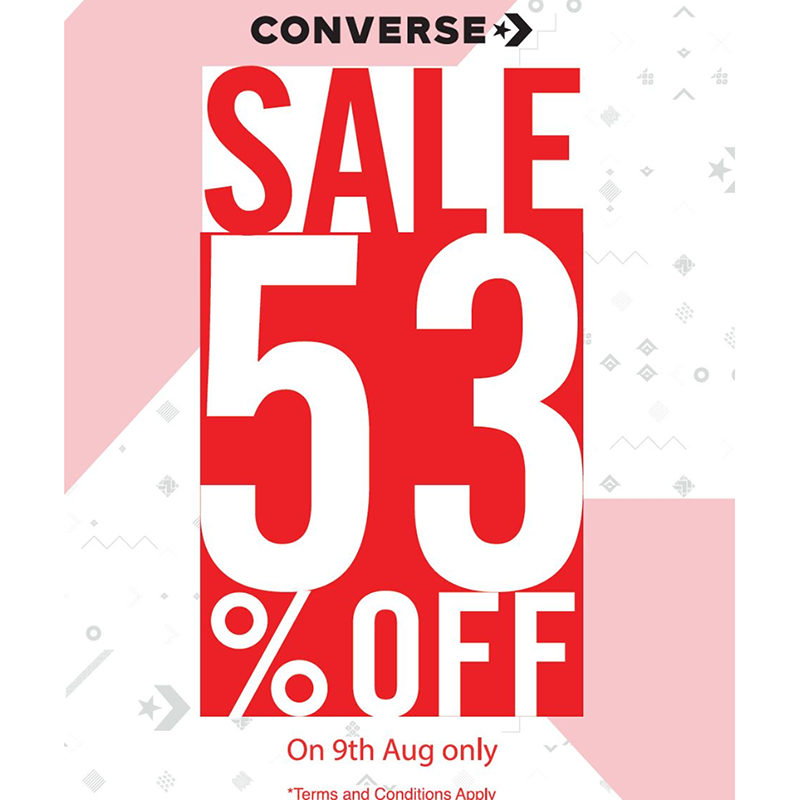 One day only 53% storewide special sale on National Day! 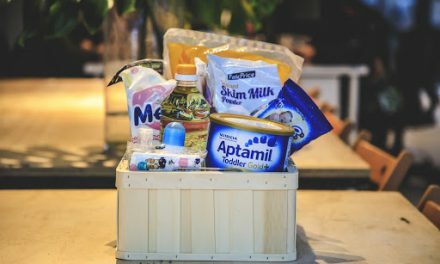 Count on Lazada to give Singaporeans special discounts on anything on their huge selection of goods from all over the world. Click here to shop the sale. Check out a ton of offers from Creative that lets you purchase some of their best-selling audio equipment at just $5.30. You can get free shipping and an additional $53 off with a minimum spend. You can see all the items on sale here. Get Buy 2 Get 1 Free (Most selected items) for Health & Fitness supplements at Nutrition Depot! Promo applicable online & in-stores. Manduka Pro Mats are available at $53 or $53 off, depending on the item at their Somerset store! Check out the Facebook post below. If you’re looking to grab jewellery for a gift or for yourself during National Day, Pandora has a promotion that lasts until August 12! 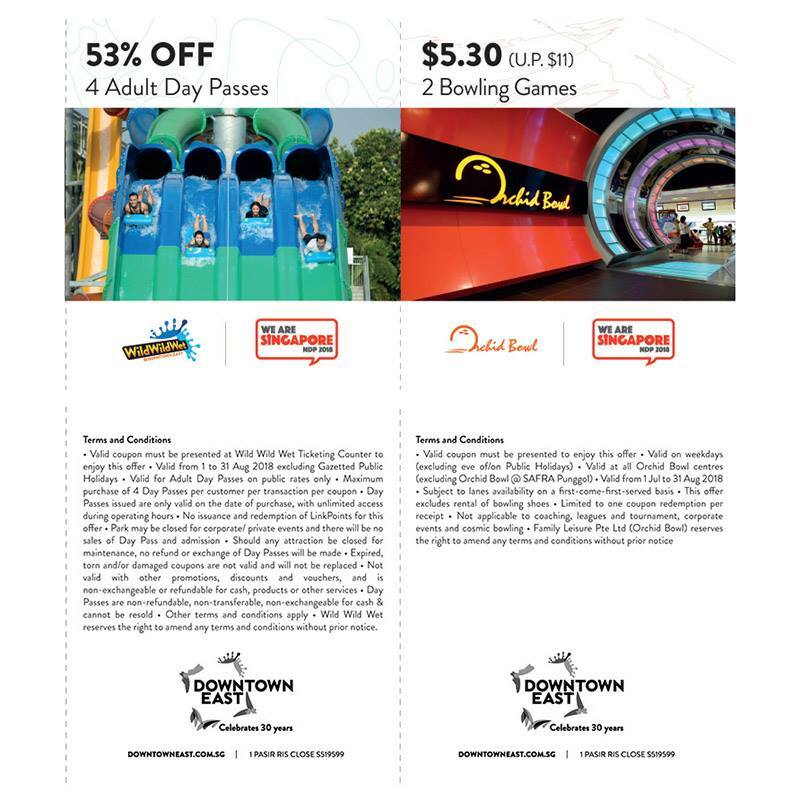 You can get 4 Wild Wild Wet adults passes at 53% off or Orchid Bowl tickets at $5.30 for 2 bowling games. Avail of their $59 Teaser Package (1 Skydive), valid only for Singapore residents until August 31. You and the family 20% off on all game rooms with code: SG53! 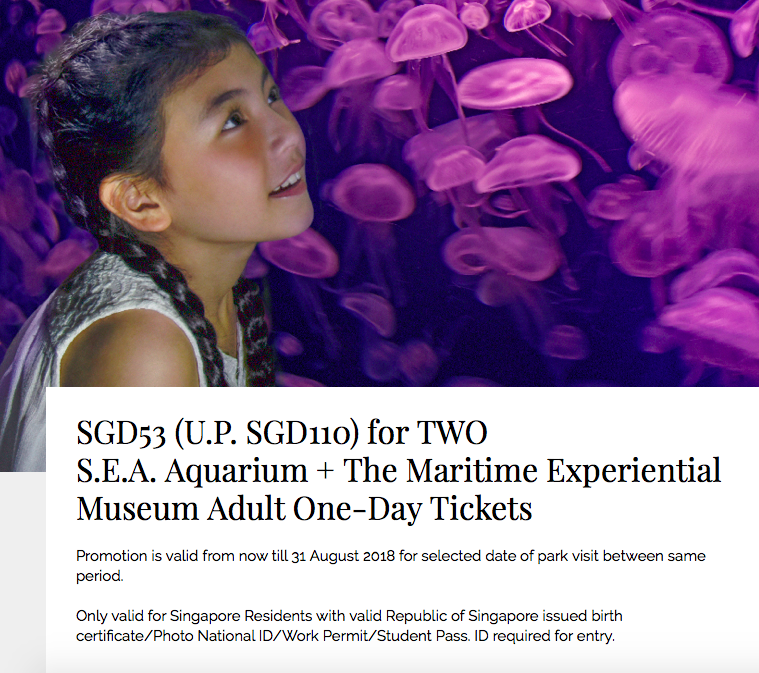 You can get TWO SEA Aquarium + Maritime Experiential Museum Adult One-day tickets for $53, valid only for Singapore residents. Check out how to book on their website. 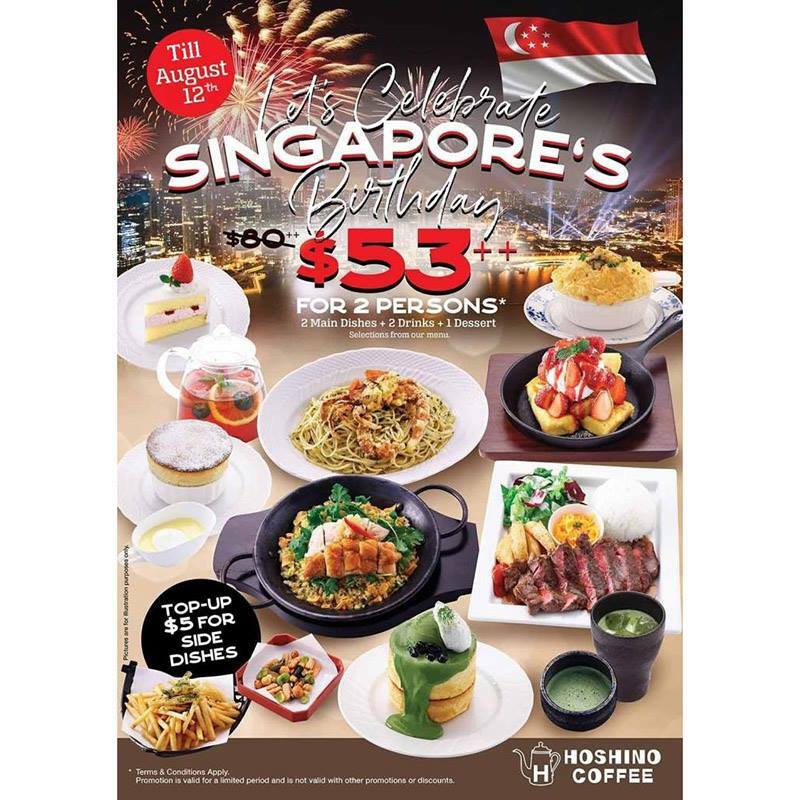 Resorts World Sentosa has great ticket offers for National Day. Check them out at their website here. Commemorate the nation’s 53rd birthday and enjoy a dazzling display of fireworks in the unrivalled comfort of our well-appointed rooms. Take advantage of our close proximity to the celebrations and watch the parade come to life with our panoramic view of the Marina Bay area right here at Swissotel The Stamford! 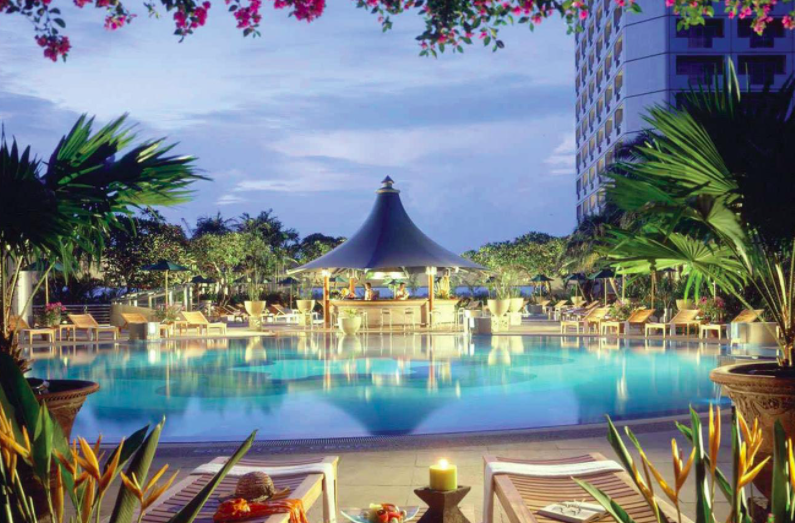 For National Day Preview Package from $488++ onwards, please Click Here. 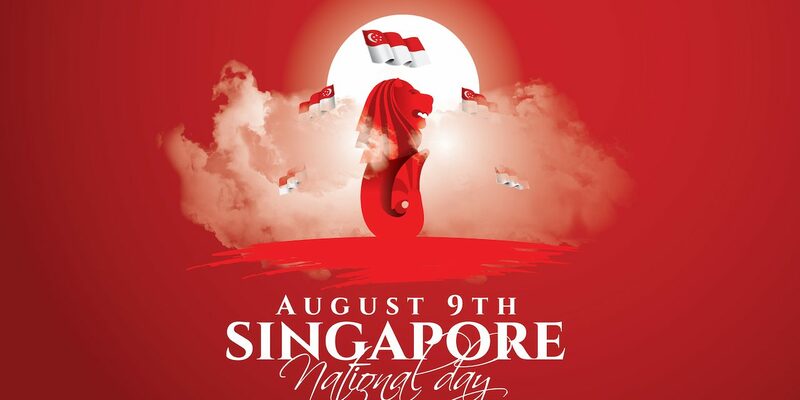 For National Day Package from $888++ onwards, please Click Here. Celebrate the Lion City’s National Day Parade 2018 at the Marina Bay Floating Platform during your stay at The Fullerton Bay Hotel. 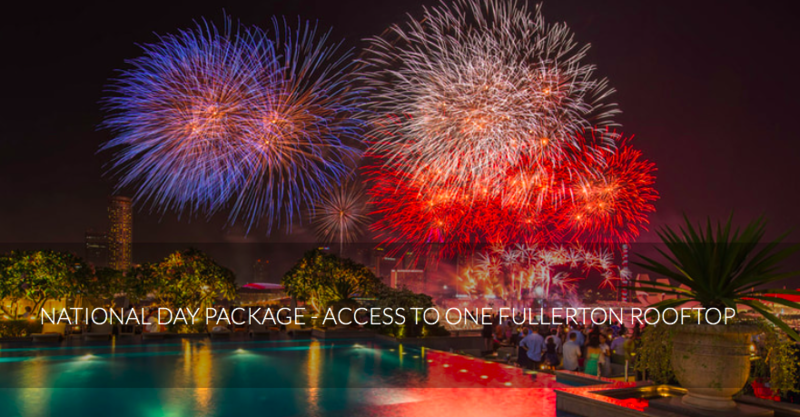 Hear the roar of the celebrations from the comfort of well-appointed rooms and celebrate with your family and friends over a highly anticipated display of fireworks overhead. You can book this deal here. 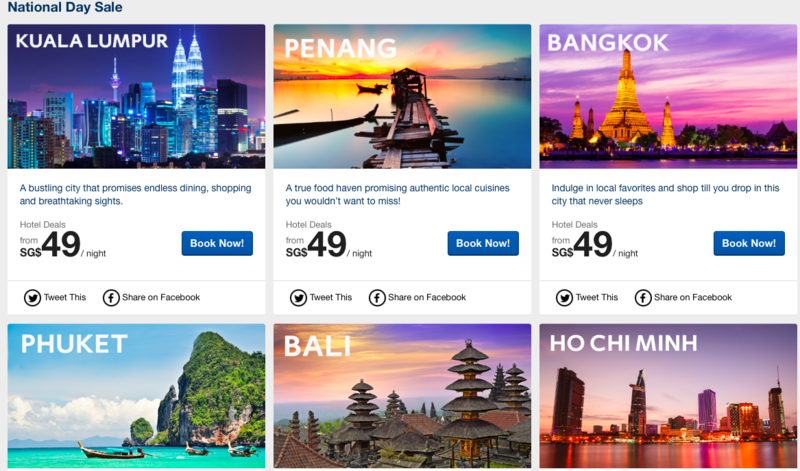 You can book flights for as low as $49 on Expedia now! 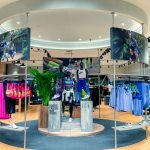 Click on this page to see the deals. Use the promo code in the post below to get 25% adult and kid tickets to Kidzania Singapore. NS men get a special treat from Grab to thanks them for their service. Use the special code to get $5 all Grab rides for this week. Check out the deal below.